Ready to learn how to draw Chubz? You can either download the directions on this pdf, or you can follow along with the directions below. 1. Draw the circle shape for Chubz' body. 6. Draw the rest of his face. And there you have Chubz! Great job!! idk but the pics dont want to appear on chubs website! 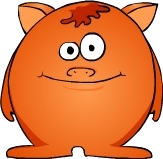 This Monster, Chubz, is a great orange color and is very cute! The Town of MUB gets a New Name.